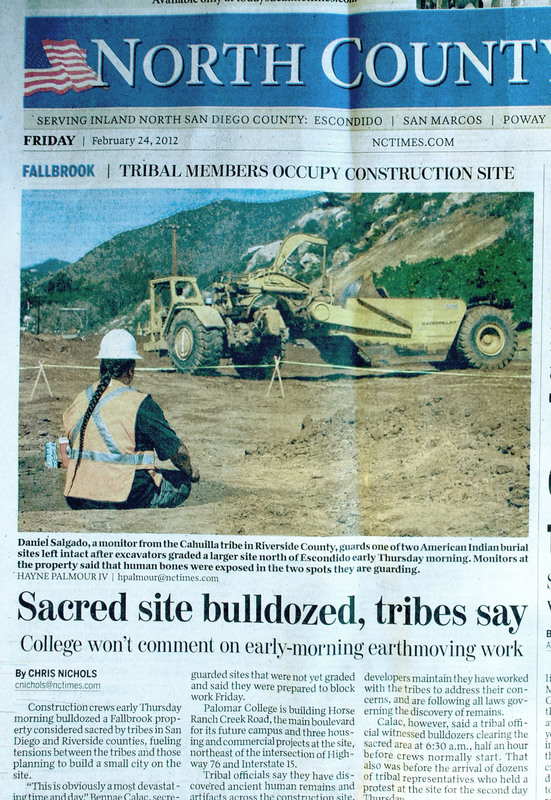 Save Tomkav — Luiseño Village and Burial Site | "Occupied Since Creation"
Today in court, Judge Harry Elias denied the request of Luiseño tribes for a Temporary Restraining Order and gave Palomar College the green light to continue desecrating the village and burial grounds of Tomkav. A report from the day will be posted soon. This morning’s hearing for the Temporary Restraining Order sought by the San Luis Rey band to halt work at Tomkav was attended by about 20 tribal representatives. 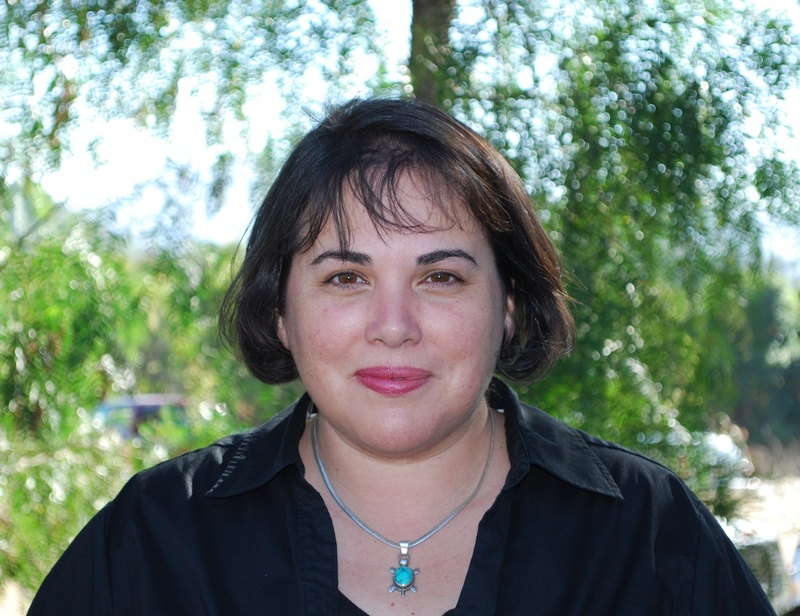 The judge heard preliminary comments by the attorneys of Palomar College and San Luis Rey. 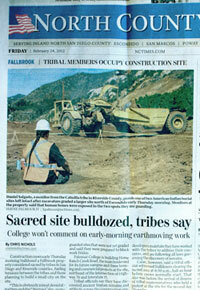 Palomar College agreed not to allow work in the area for 24 hours while the case is being heard. The judge asked to have 24 hours to review all the paperwork, and court will reconvene tomorrow at the Vista Courthouse (Dept. 25), 9:30am. This is one of many cell-phone videos taken by tribal members early Thursday morning, when American Pride and Balfour Beatty Construction illegally bulldozed over the burial and village grounds of Tomkav. 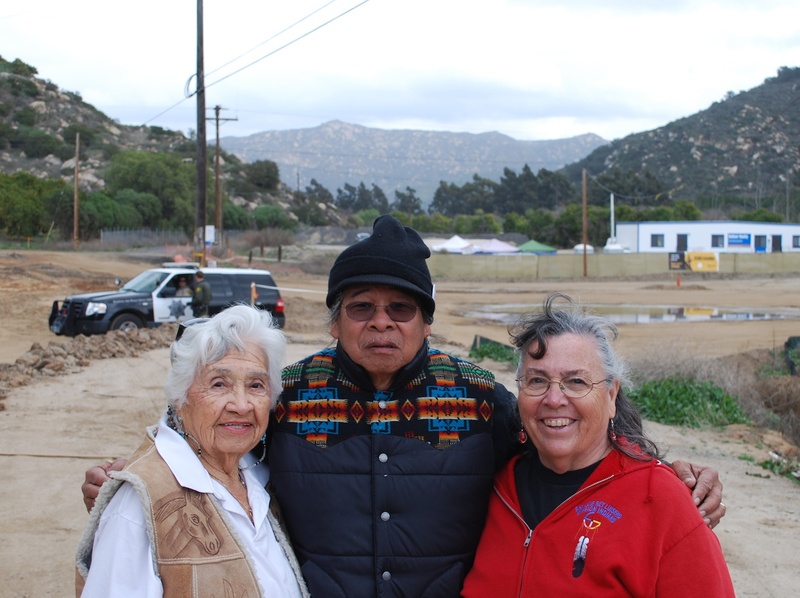 Tobias, a young Cahuilla man, spent days volunteering at Tomkav as a monitor, keeping watch over the burial grounds and sleeping in his truck overnight to catch any early-morning attempts to further bulldoze the site. Filmed at Tomkav on 2/25/12. 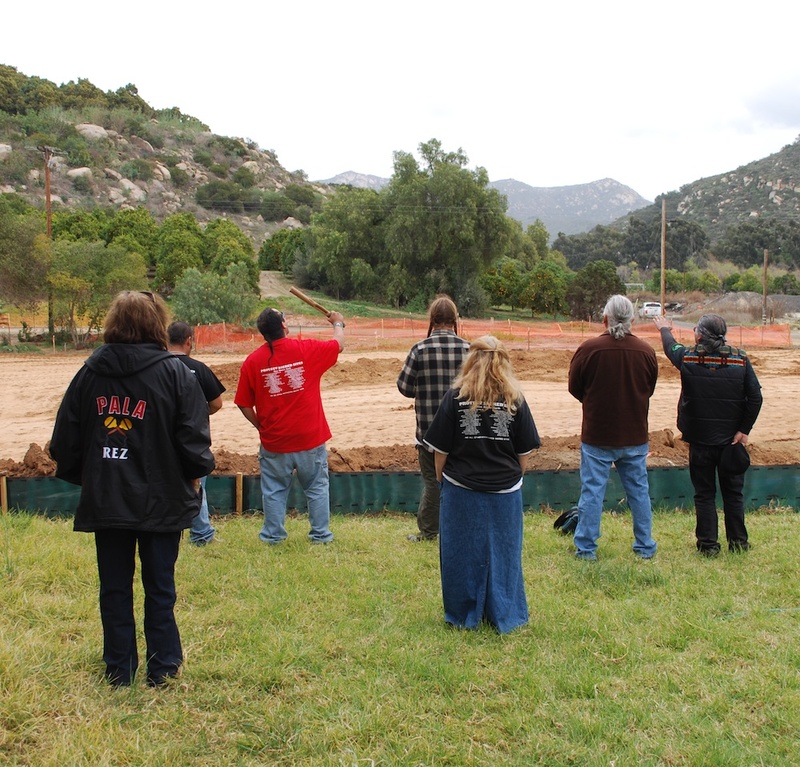 Excavating and grading activities began again this morning, though some distance away from the burial sites that tribal members are standing ground to protect. Fencing crews (United) showed up with a large truck full of chain-link and began fencing the entrances to the site. Caltrans was also on site, because the road they are fencing is the old 76 highway route and has a Cal-Trans right-of-way. CalFire and the local Fire Department showed up again because somebody called them to “report” the sacred fire. 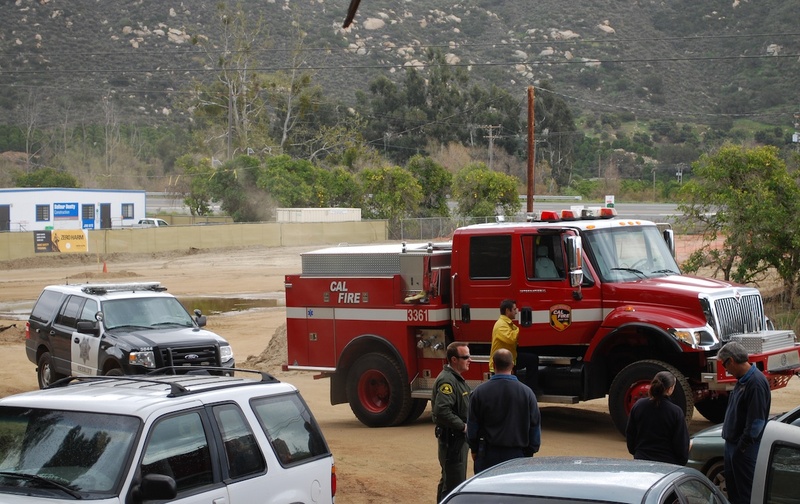 They left without incident after acknowledging that the small, contained fire was safe, especially because weather conditions make this a “burn day”. Sherrifs drove by a few times this morning, making their first visit to the vigil site. They spoke with a friendly demeanor, asking lots of questions and gathering information. Today there was a large community gathering at Tomkav, and for once everyone could draw a clear breath. Bird-song and a light breeze in the trees had replaced the grinding, pounding, and scraping sounds of heavy equipment desecrating the land. Many songs, prayers, and words of inspiration were shared throughout the day, with drum, rattle, and clapper-stick. About 60 people had gathered as the afternoon drew on, mostly from the seven Luiseño bands and other surrounding tribes. Who are you and whats your relationship to this project? My name is Merri Lopez-Keifer. 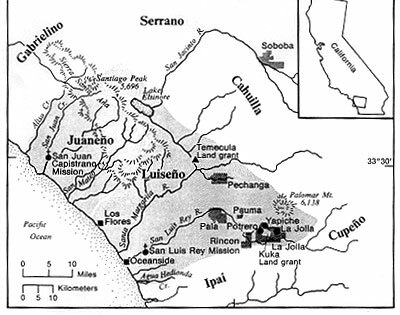 I’m the legal counsel for the San Luis Rey Band of Mission Indians. I’m also a tribal member of the San Luis Rey band. 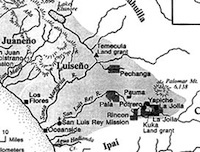 There are seven bands to the Luiseno nation–from the Soboba in the mountains to Pauma, La Jolla, Pala, Rincon, Pechanga and San Luis Rey. This is an area that they are proposing to put a major thoroughfare–a road leading to housing for thousands of people and a new Palomar College satellite campus. Its going on top of what is known to Luiseno as Tomkav.